Jerusalem is situated at 770 metres above sea level (Mediterranean) and more than a thousand metres above the Dead Sea. The old city is on two hills, within the walls of 1542, and retains the memory of important moments of the Old and New Testaments: the First Temple, the Tower of David, the Via Dolorosa, the Chapel of the Flogging, the Holy Sepulchre, the Church of the Dormition, etc. 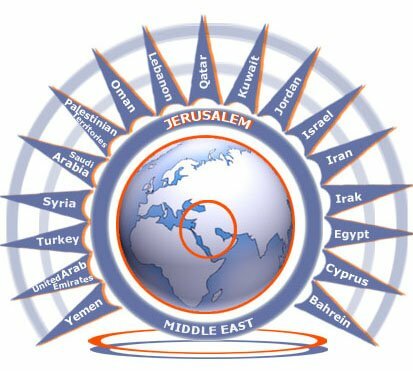 Jerusalem is divided into four quarters: Jewish, Christian, Armenian and Muslim. The Jewish Quarter (South-East) is the High City in Herod’s time. One can find the Israelite Tower, the Western Wall ("of Lamentations"). The Christian Quarter occupies the West part of the City. Among the most important monuments are the Basilica of the Holy Sepulchre, the Church of Saint John the Baptist, and the Church of Saint Veronica on the Via Dolorosa. The Muslim Quarter, the biggest one, includes many Christian holy sites (Via Dolorosa, Monastery of the Flogging, Church of Saint Anna, Chapel of Ecce Homo) and the Temple Mount (the Dome of the Rock, the Al-Aqsa Mosque). Lastly, the Armenian Quarter, the southernmost part, almost exclusively inhabited by Armenians, Seat of the Armenian Orthodox Patriarch, one of the three Custodians of the Holy Land (the other two being the Greek Orthodox Patriarch and the Custodianship of the Friars Minor), whose jurisdiction covers the Holy Land and Jordan. The new city extends towards Ramallah to the North, Bethlehem to the South, into the desert to the East and into Shefelah to the West. It has half a million inhabitants, of which a quarter is Arab (Muslims and Christians). Vatican Radio - SYNODUM EPISCOPORUM - All the contents on this site are copyrighted ©.